<--Slide this border right to make more of the index visible. The left frame contains an expandable index that provides several different entry points into the book. Click on any icon to expand an index heading. If the index display does not fit in the frame, you can slide the frame border right or left by grabbing the right edge of the frame border with your mouse, and dragging it left or right. The Table of Contents provides a link to each of the 45 chapters in the book. The Table of Illustrations provides a link to each of the photographs in the book. The first link, the Thumbnail Navigator, shows each of the available photos in thumbnail size. Click on any thumbnail to view an enlarged version of the photo. Click the enlarged photo to jump to the page in the book where the photo is included. The Index provides a selection of both thematic and alphabetic word entry points described in more detail below. 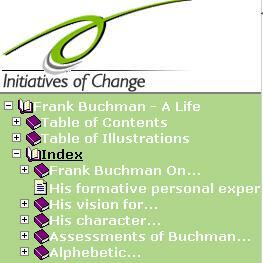 Several main themes from the book are organized as index entries. Expand the Index entry to see the list of themes. When you expand one of these themes, you will see a list of sub-topics and a set of page references where aspects of the topic are presented. When you click on a topic heading, you will next see a summary of all the pages included for the topic. Click on any of these page references to see the entire text for the desired page. You can also go directly to one of the pages listed in the index entry by clicking on the page reference attached to the index entry. The last index entry in the left window is an alphabetic index. Expand this to see a list of starting letters. Click on any letter to see the index entries starting with that letter. These will display in the main window as shown above. While viewing a list of words starting with a given letter, you can jump to any other section in the alphabetic index by clicking on a letter in the menu at the top of the display. To jump to a page reference, click on any page number listed. Page references ending with an 'n' indicate that the reference is in a footnote on that page. While viewing a book page, you can return to the index page you were last in by clicking on the Index button at the bottom. The navigation buttons at the bottom of the screen provide ways to select any book page. The example shows what the buttons look like when viewing page 15. The current page number is listed between the Page up and Page down buttons. View the next or previous page by clicking one of the buttons on either side of the center Page button. You can also skip to any page by typing a new page number over the page number listed on the Page button. After typing a new number, press enter or click the button to view the desired page. The printer icon button [ ] allows you print the currently displayed book page. It will open your print dialog box allowing you to select your print destination and other options. Direct printing is not available on all browsers. In these cases use the Print option provided in the File menu. The Index button displays the alphabetic index. If you have a word in the search box, the Index button will jump to the section of the alphabet with the same starting letter. Otherwise it will display the beginning. When you jump to an index entry or do a search, the Page button retains the page number you were last viewing. After doing a search, if you want to return to the page you were viewing, just click the Page button. The Search button allows you to find paragraphs with any word or phrase. Full text searching capabilities are described in the section on searching below. Type your word or phrase and press enter or click the button. The button with the ? question mark displays the Help text. The Exit button closes the book window. 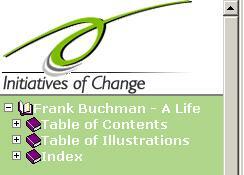 The Frank Buchman - A Life book has over 1,000 source references and other helpful endnotes. Each endnote appears as a hyperlinked number in the page text. To view the endnote, click on the number and the Endnote page for that chapter will display. To return to the page you were viewing, click the return link next to the endnote. You can also click on the Page button at the bottom which lists the page you were viewing when you clicked on the endnote link. See also the author's Note on Source References on page 12. + A leading plus sign indicates that this word must be present in every paragraph returned. - A leading minus sign indicates that this word must not be present in any paragraph returned. By default (when neither plus nor minus is specified) the word is optional, but the paragraphs that contain it will be rated higher. < > These two operators are used to change a word's contribution to the relevance value that is assigned to a paragraph. The < operator decreases the contribution and the > operator increases it. See the example below. ( ) Parentheses are used to group words into subexpressions. ~ A leading tilde acts as a negation operator, causing the word's contribution to the paragraph relevance to be negative. It's useful for marking noise words. A paragraph that contains such a word will be rated lower than others, but will not be excluded altogether, as it would be with the - operator. * An asterisk is the truncation operator. Unlike the other operators, it should be appended to the word, not prepended.
" The phrase, that is enclosed in double quotes ", matches only paragraphs that contain this phrase literally, as it was typed. find paragraphs that contain at least one of these words. ... word "oxford", but rank it higher if it also contain "group". ... word "oxford" but not "group". ... "professor" and "smith", or "senator" and "smith" (in any order), but rank "professor smith" higher than "senator smith". ... "German", "Germans", "Germany", and "Germantown". ... "some words of wisdom", but not "some noise words". Single-letter and 2-letter words are not indexed. You may include these in your searches but they will not influence the result set and they will not be highlighted. Searching is not case-sensitive. Words will be matched even if they do not have the same case as the search term. After doing a search, the search facility will list all of the paragraphs that contain your search word(s). Results are relevance ranked. Each paragraph listed shows the chapter and page number containing the paragraph. Click on the hyperlink to jump to the listed page. Beneath the hyperlink is a summary of the paragraph showing the hit words in context. Your search words will also be highlighted on the book pages when you display these. To turn off the highlighting, delete the search words in the Search button box and re-display the page by clicking on the Page button.